Yet another book from my Master's program and the title is self-explanatory. 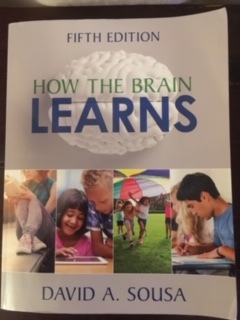 While the first chapter covers basic form and function for the human noodle, most of the book explores the ins-and-outs of learning. Obviously, it's a big topic and crucial understanding for a teacher. I'll spoil the ending: it turns out we don't usually teach in the best way for the brain to learn. And "we" doesn't mean my Master's cohort. It means our entire profession - across subjects, age groups, nationalities, etc. Fortunately, Sousa offers many suggestions for alternative approaches. The book is highly readable as textbooks go and it's not all theory either. Each chapter culminates with a "Practitioner's Corner": materials to use in the classroom. Math - My daughter has started high school this year. While she's mostly doing well, math is giving her a run for the money. As mathematics was my best subject in school - better than music, even - it has fallen to me to help. It can be rough going some nights. Sousa offers plenty of insight as to why people struggle with math. I may actually have my daughter read the section on math anxiety to see if any of it rings true for her. The arts - Sousa is a strong advocate for the arts, trumpeting all of the benefits to the brain, especially from music. While the Mozart Effect is a well-established exaggeration if not outright myth, there are other proven benefits, especially from learning to play an instrument. Parts of the brain actually grow from the experience and the advantages are long-term, even if you stop playing. For those of us in music ed, arguing for our right to exist is part of the job. Sousa provides plenty of fodder. Bloom's Taxonomy - If you've ever taken an ed class in your life, you probably know Bloom's, essentially a hierarchy of intellectual challenge. Once you can remember new knowledge, you can begin to understand it. Once you understand it, you can apply it to new thinking. And so on. The taxonomy itself has evolved since its initial introduction in the 1950s. Some of the steps have switched places and the whole structure is more fluid than it was in the beginning. It is an excellent means for adding ever-increasing challenge for one's students, something I am actually thinking about a lot in my own current practice. Good timing. The book is definitely intended for teachers but much of it would still be interesting for the general reader. Part of why I'm not a part of the traditional education system is all the tradition and resistance to change. The whole system needs a reboot. I may pick up this book. I've been having this conversation a lot recently: practice will always lag behind theory. Even when administrators talk a good game, the systemic pressure in favor of the status quo is considerable. For what it's worth, though, I do see incremental changes every year. New teachers coming into the profession have clearly been exposed to a lot of meaningful training. As a veteran teacher rooting for them to succeed, I worry the system will wear them down. But I honestly believe we're slowly creeping in the right direction. Interesting post today as teaching, school, parents and studies has been much on my mind. I wish it was possible to talk to someone like you and Andrew as Arizona is at a crossroads in education right now. No doubt, the border states have a tough row to hoe right now. Souza doesn't devote a lot of space to English Language Learners. He admits the problem, yet does not despair of the possibilities.